Moving Average Convergence Divergence or MACD is a trend chasing indicator that brings a relationship of three different exponential moving averages. MACD is displayed under the stock price chart, where first line – longer period EMA (usually 26 days) is subtracted from shorter period EMA (usually 12 days) and second line – so called signal line is usually 9 day EMA and serves as slower moving average on the chart. The faster moving average (12-26 days) bends around the slower moving average (9 days). The histogram below them shows the difference between the two averages – more they move off each, greater the bars become. Moving Average Convergence Divergence is most used for signal line crossovers when the indicator helps to decide if and when to take the position. When faster MA goes up and crosses the signal line, it is understood as a bullish signal; when faster MA falls down and crosses the signal line, it is considered as a bearish signal. However, it does not mean that when there is the bullish signal it is the right time to take a long position. It also depends whether the averages are in a positive or negative territory and what is the level of volatility of underlying stock. Above example of Micron – In the beginning of September MACD line (black) crossed down the signal line (red), which created a bearish sign. The stock did not necessarily decline, however it lost its bullish steam and got into sideways direction building its base for another rise. MACD is also in the positive area (above central line) and thus stock is generally in the bullish trend. Later on, the black line bounced up from the border of positive/negative territory crossing up red line, which gave a good bullish signal on 14 November and then led to significant rise in share price. Signal line crossovers are most useful to traders when they apply MACD indicator to the chart. Central Line is depicted below as a slim green line which separates positive and negative territory of the histogram. The crossover of a central line may outline the existing trend is over and change in direction of the stock price is happening. When MACD line (black) crosses down the central line (green), it is understood as bearish crossover and stock price will likely decline. When MACD line (black) crosses up the central line (green), it is understood as bullish crossover and stock price will likely rise. 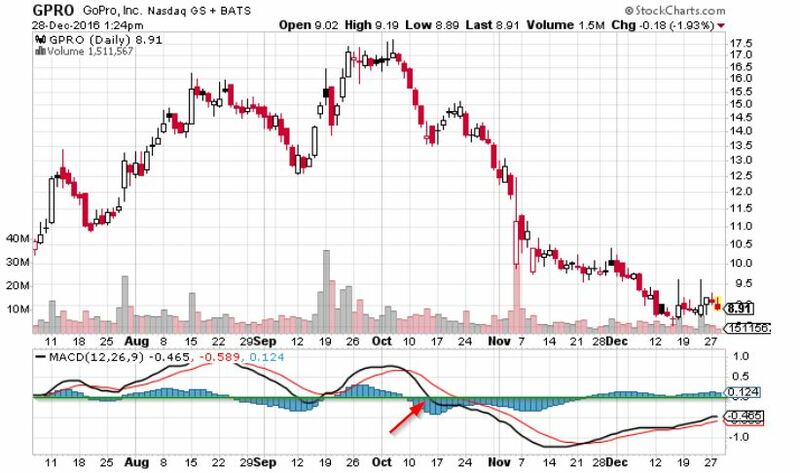 GoPro above was in upside trend until the MACD line broke down the central line in the middle of October. The bullish trend was halted and stock price started to decline. Notice, the MACD line with signal line stayed in negative territory. 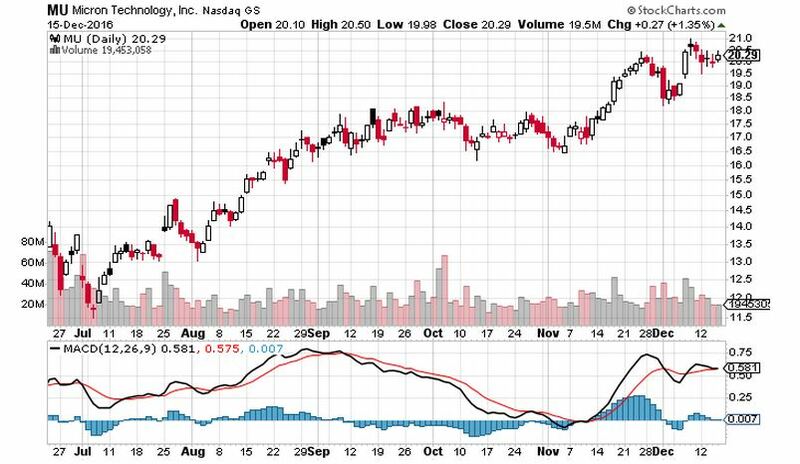 Even though MACD line crossed up the signal line, the stock price is still not in upside trend. It rather indicates that stock is building its base and the bullish trend will come maybe once the MACD rises back above the central line. There is also a known concept of positive and negative divergence. Bearish is when stock price trends up, while MACD trends down and bullish when stock price trends down and MACD trends up. Based on these findings it is possible to determine whether the stock is preparing for reversal or not. This can serve as a strong tool if used correctly and also with other technical indicators.